on Race and Medicine on Wednesday, February 20, 6:30 pm. 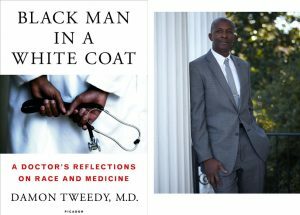 Dr. Tweedy will read from his profound memoir and discuss his experiences grappling with race, bias, and the unique health problems of black Americans. His book was selected by TIME magazine as one of the Top 10 Non-Fiction books of 2015. He has published articles about race and medicine in the Journal of the American Medical Association (JAMA) and other medical journals. His columns and op-eds have appeared in the New York Times, Washington Post, and various other print publications. We now have several signed copies of Dr. Tweedy’s book available for sale (Paperback – $15; Hardcover – $23; Audiobook – $23). Please contact Kristina Gilbert to purchase. Dr. Tweedy is a graduate of Duke University School of Medicine He completed both his medical internship and psychiatry residency at Duke Hospital. He is currently an associate professor of psychiatry at Duke and a staff psychiatrist at the Durham Veteran Affairs Health Care System. Dinner will be served at 5:45pm in the Fellowship Hall (Menu: Baked chicken, scalloped potatoes, squash, rolls). Cost is $5 per person, $3 per child (under 12), and $20 max per family. Register by February 18, 12:00pm: http://bit.ly/myWPCevent.